Wed, Jan. 30 2008 03:19 PM ETThe former head of the Eritrean Orthodox Church, who is widely believed to have been forcibly removed from office by the government, was relocated to an undisclosed locale to prevent his meeting a visiting U.S. delegation, reported a Christian persecution watchdog group Tuesday. To Read The Rest of the News, click HERE. It is amazing how dictators of different eras share the same trends. Derg deposed His Holiness Abune Theophlos, killed and burried in an unknown place. The so called liberators deposed and imprisoned their patriarch. They saved his life may be because the fear a world wide uproar. I am trying to put forth the thesis that the Ethiopian Christian Kingdom, prior to the great Muslim devastation from 1527 to 1543, was essentially a non-imperialistic nation, with a tolerant attitude toward its non-Christian subjects and regions. This tolerance, in its many forms as I will discuss below, allowed Islam to flourish during moments of weakness within the Ethiopian Kingdom, and eventually allowed the Muslims to mobilize into a destructive jihad in the mid-sixteenth century. Ahmad ibn Ibrihim al-Ghazi (1506-1543) known as Grañ or the Left-Handed by the Christian Ethiopians, spearheaded Ethiopia’s devastation by the Muslims from 1527 to his death on the battlefield in 1543. Grañ was from the southeastern Muslim tributary of Adal. He monopolized the acute jihadist mood of the Muslims of the time, sparked by constant defeats by Christian Ethiopia, and set out to lead this jihad himself. Having killed the sultan of Adal, he proclaiming himself both leader and Imam, and started his campaign by refusing to pay tributes to the Ethiopian Emperor. During his scourge, he managed to ravage the Christian Ethiopian Kingdom of much of its churches, monasteries, religious art and sacred texts, and embarked on the total Islamization of the country. At his death, his movement disintegrated, and Ethiopians were able to rebuild their lost Kingdom. The Ethiopian Kingdom, prior to Grañ’s uprising, was essentially a heterogeneous region, with Muslims, Pagans, northerners and southerners living under the dominant Christian Amhara civilization. This tolerant attitude was also practiced in the peripheral tributaries where the only expectation the Christian Ethiopians had of these regions was that they pay periodic taxes and tributes. These regions were left alone for the most part to practice their own religions and customs. Muslim tributaries also played an important role in trade routes and as intermediary traders. Ethiopian Christians were not really interested in leaving their highland Kingdom behind to live in the less appealing lowlands. On a deeper level, their Christian and “neighborly” preference was to leave their tributaries as they were without interfering too much. Certainly there were elements of proselytization, especially with the important monastic culture of the Ethiopian Church, but there was too much to integrate within the Church itself—between Church and State, between the various Orthodox factions, between Egypt’s Copts and appointed Patriarchs, etc. But wherever there was interaction between Ethiopian monarchs and their Muslim tributaries, Muslims were not treated any differently than the other non-Muslims of the Kingdom. They may have received even more tolerance in view of their importance as trade middlemen, and also their strong and cohesive culture and system. Yet, at the great moment of destruction, the Muslims had a completely different strategy, of annihilation in fact, of the Christian elements, despite the friendly beginnings between Ethiopia and the Muslims at the early stages of Islam’s history. Here is a summary of how I came to these conclusions. Earliest contacts with Muslims describe the refuge the Ethiopian (by now Christian) Aksum Kingdom gave to Muslims fleeing persecution, around 615 AD, including Mohammed’s son-in-law. This exempted Ethiopia from the jihad which started to take place in nearby regions. Later on, when the Muslims had control over Jerusalem, Ethiopian pilgrims were allowed to travel there, and even maintain holy sites in the city. Ethiopian Muslims lived peacefully and affluently in Ethiopia proper through their privileged role in trade, and received most of the benefits of Ethiopian citizenry. The peripheral Muslim regions were expected to pay tributes to maintain their inland routes with their trade caravans. As these Muslim settlements grew, they started to push for expansion inland, but were curtailed and some were put under some type of Ethiopian rule. This aggression, though, was initiated by the Muslims. Emperor Amda Siyon I (1313-1344) was really continuing with the strategy of bringing these trade routes under Ethiopian control (to reduce the Muslims’ aggression and to optimize the Ethiopian economy) when he began his ambitious expansionist scheme. It was more politico-economic rather than religiously motivated. Such Muslim lands that Amda Siyon and his predecessors put under Ethiopian control were expected to pay taxes and tributes, like any other non-Muslim regions. But they were generally left alone to pursue their own cultures and religions. They were, in effect, semi-autonomous regions, with their own rulers, religions and cultures. One important characteristic of the Ethiopians was their reluctance, as a group, to venture out of their beloved highlands into the “colonies.” Mostly this was a “laissez-faire,” tolerant attitude. Also, it was a lack of desire to live with heathen peoples, in inhospitable and climatically difficult areas. 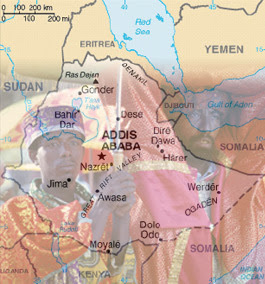 Another aspect is the heterogeneity of the Kingdom itself, with Ethiopian Muslims, Pagans, and other ethnicities from tributary regions living within the Kingdom, albeit all under the umbrella of the dominant Amhara Christian culture of the Ethiopians. Although the Ethiopians were expanding their Kingdom initially as a reaction to Muslim aggression, Amda Siyon’s “I am the Emperor of all the Muslims in the land of Ethiopia” was really said in a spirit of inclusion, not aggression. This is shown by his tolerance of the Muslims’ beliefs and way of life, and by his continuing his precedessors’ policy of allowing the Muslims to live in semi-autonomous peripheral regions practicing their religion freely within their own ethnic, social and cultural structures. While peripheral Muslim regions showed signs of submission, paying taxes and deferring to the Emperor of the time, they still used any opportunity to advance aggressively into Ethiopia, or to subvert what they believed to be a weak ruler. This invariably resulted with regional wars, from which the Ethiopians always returned victorious. The regularly defeated and bitter Muslims finally declared jihad on Ethiopia. This was a far cry from the jihad-free promise they gave Ethiopians at the time persecuted Muslims were given refuge by the Aksumite Kingdom in early Islamic history. A number of factors contributed the Muslim leader Ahmad ibn Ibrihim al-Ghazi’s (Grañ’s) success. - Help from other Muslims, namely the Ottomans, who provided firearms to the Muslims, weapons which the Ethiopians did not have until later via the Portuguese. - Weakened religious and social structures within the Kingdom itself, due to the now heterogeneous society, intermarriage with Muslims and other non-Christians, conversions from Christianity, and other social factors. - Rivalries between feudal Ethiopian lords and lack of allegiance to the Emperor and the Kingdom, often with a weak Emperor at the realm. - Compromises and leniency toward the peripheral Muslim settlements—especially during uprisings and rebellions—by later Emperors, unlike Amda Siyon’s and Zara Yaqob’s stringent reactions. - Fear of Catholicism by an important ally, the Portuguese, whose assistance was sought later rather than sooner. Grañ was thus able to exploit these internal weaknesses, and set to destroy all of Christian Ethiopia and supplant her with a purely Muslim state. Quite different from the tolerant Ethiopian Emperors which allowed Muslims to sustain their beliefs, cultures and religions. Thus, my conclusion is that the Ethiopian Kingdom never set out to be an invasive, imperialistic presence. It tolerated semi-autonomous Muslim regions which it brought under control to monopolize trade routes and curtail Muslim aggression. Muslims lived peaceably in “greater” Ethiopia until they felt they could take advantage of the situation, and attacked, although they were continually defeated. But Grañ finally came with all the circumstances on his side. Ethiopians never endeavored mass, forced, conversions, never tried to coerce different ethnicities to change their cultures and societies, and for the most part left the Muslim regions apart from Ethiopia proper as semi-autonomous tributaries. And the Ethiopian Muslims (who were citizens of the Kingdom and not part or the regional settlements) lived affluent and privileged lives as traders, and to some extent as ambassadors to foreign lands where they took their caravans. The degree of intolerance set by Grañ during his five years of destruction with his aim of a “Futuh” or a complete conquest of Ethiopia was spectacular. All references to Christianity, churches, monasteries, religious art, sacred books, etc. were destroyed. And the Ethiopians were to live as a completely subjugated people. But, with the help of the Portuguese, and more astute leaders—Libna Dingel (1508-1540) and his son Gelawdewos (1540-1559)—the Muslims were finally driven out, and Ethiopia retrieved lost lands. It is hard to say how the Ethiopians should have dealt with these problematic Muslim tributaries. They could have been more diligent with their proselytization, or they could have depended less on Muslim traders and trade routes and consolidated this economy solely under Christian Ethiopians. Nonetheless, their non-interventionist style allowed Islam to flourish over the years, to devastating effect. My small readings about other Christian lands, their treatment of Muslims, the treatment by Muslims of Christians and other ethnic and religious groups, indicate to me that Muslims are generally and consistently intolerant of other ethnic and religious groups, and this trend continues today. The United States, Canada and Europe, it seems to me, are in a very similar situation in which Ethiopia found herself those many centuries ago. These tolerant, heterogeneous societies, giving equal or even priviliged treatment to Muslims, may all one day dissipate when internal weaknesses and external forces give Muslims—both within and without the West—the strength to carry out their destruction. I strongly believe that Muslims are not to be underestimated in any manner whatsoever. Harold G. Marcus, The History of Ethiopia. Richard Pankhurst, The Ethiopians: A History. Mordechai Abir, Ethiopia and the Red Sea: The rise and decline of the Solomonic dynasty and Muslim-European rivalry in the region. Paul B. Henze, Layers of Time: A History of Ethiopia. Ethiopia's prime minister, Meles Zenawi, tells Simon Tisdall in a rare interview that Qatar and other un-named Arab Sunni Muslim states were financing Eritrea's covert operations against Orthodox Christian Ethiopia. He suggested Eritrea was intent on radicalizing Ethiopia's Muslims, particularly in the eastern Somali regional state where a low-level insurgency has been underway for the past two years. It may also have helped establish jihadist "cells" inside Kenya, he said, but once again the international community was paying insufficient attention. The Ethiopian premier has acknowledged the rise of Islamic fanaticism in Ethiopia. He has very rightly mentioned Qatar. He pinpointed at the flies ignoring the Elephant, in funding Ethiopian Islamofascism. The Elephant we all know is Saudi Arabia. The Saudis are funding Wahhabi extremism in Ethiopia, with the help of corrupt government officials like the once popular Ali Abdo. We have no proof of what the involvement of the Saudi-Ethiopian tycoon Al-Amudi. A group of Antiguans and Barbudans who want to fully experience and express their emancipation both “spiritually and culturally” have moved towards developing an Ethiopian Orthodox Tewahedo Church Diocese here. Receiving conviction of their faith and their desire to meet in one accord seven brothers and sisters made a pilgrimage to the headquarters of the Archdiocese of the Ethiopian Orthodox Tewahedo Church in the Caribbean and Latin America based in Trinidad on 23 Nov. This headquarters is also the mother church for the Ethiopian Orthodox Tewahedo Church in the western hemisphere, outside of Jerusalem and Ethiopia. The visit will be an historic one since the Archbishop Thaddaeus will consecrate the church in Antigua and baptise new members. “We have 30 potential members of which nine will be baptised on 21 Feb.,” becoming full fledged members of the world church. Leading the church’s mission on the island and conducting training will be a monk priest who will arrive with Archbishop Thaddaeus for the consecration service. “The administrative monk priest will guide the process for a period of time until a local priest is ordained,” Tuckett explained. The body holds services on Sundays and on Tuesdays and Thursdays at 6 p.m. to which the public is invited to attend. 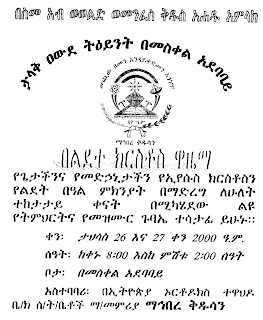 More information on the formation of the Ethiopian Orthodox Tewahedo Church in Antigua and Barbuda can be obtained from their place of meeting; or email: eoc_ab@yahoo.com; or www.ethiopianorthodox.org. The Ethiopian Orthodox Tewahedo Church headquartered in Ethiopia has been in existence for 2,000 years. The church has been established in the Caribbean for over 55 years with dioceses in Jamaica, Guyana, Barbados, Guadeloupe, Martinique and Bermuda. በሃይማኖትና በጎሳ ስበብ የሚጫረውን እሳት ለማጥፋት . . . The following article is prepared by Reporter Newspaper. It seems the issue we have been trying to discuss quite for some time seems to have got recognition. But still, the source of the problem is not getting proper attention. Let us call a spade a spade. Fanatic islam is trying to annihilate Christianity in Ethiopia. ማን ከለከለው፣ ለምን ከለከለው፣ የከለከለው አካል ቤተ ክርስቲያኒቱን በመናቅና በማዋረድ ለወሰደው ርምጃ መንግሥት ምን ርምጃ ወስዷል፣ ወይስ እንደተለመደው ምን ያመጣሉ፣ እንደ አክራሪዎቹ በቦንብ አያስፈራሩንም ብለው ንቀውናል? Father Zakaria Boutros looks like a mild-mannered, unassuming priest. But his message is rocking much of the Muslim world. His television program called 'Truth Talk' is broadcast daily into the Middle East over the Al-Hiyat satellite channel. On it, he challenges Muslims to examine what he says are inconsistencies in Islamic doctrine – inconsistencies that he says Muslim leaders don't want exposed and ordinary Muslims are told never to question. “Islam cannot stand in front of intellectual questions and no one can understand because of contradictions in Koran, contradictions in Hadith, contradictions and false doctrines. So they don't want anybody to ask and to learn. 'This is Islam, you have to accept it as it is' lest you should be killed,” Zakaria said. Father Zakaria doesn't stop at challenging the teachings of Islam. He also questions the Prophet Mohammed himself, who Zakaria says had his mind set on wordly pursuits. Father Zakaria's broadcasts have generated intense anger in the Muslim world and there's a $60 million bounty on his head. But he makes no excuses for his confrontational style. He says the provocative statements are designed to challenge Muslims to examine their faith. That was the case with James, an Egyptian who began watching Truth Talk late at night while the rest of his family slept. "When I first saw the show, I was angry at him. I wanted revenge," he said. He began studying the Koran and the Bible to refute father Zakaria's claims, and in the process learned more about Christianity and Islam. "I started to think about things I had never thought of before. My understanding changed and things became clear," James said. James came to faith in Jesus Christ watching Father Zakaria. His wife soon followed. "I realized Islam was a fake religion, Mary said. “When I learned the truth, I removed my veil. I felt freedom. I had been released. "Life is not about religion it's about a relationship between us and Christ. Christ is life." Father Zakaria says the Muslim world is full of people like James and Mary. Thousands of people visit his Internet chat room on 'Pal Talk' every month. Even the widely-quoted CIA Fact book cites the following numbers in support of the first claim: Muslim 45%-50%, Ethiopian Orthodox 35%-40%, animist 12%, other 3%-8%. Irked immensely by this sad state of affairs, I am compelled to offer this note. It has a two-fold purpose. My first purpose is to provide a statistical profile of the Ethiopian people based on the 1994 national population and housing census. So, where did the fanatics get all that statistics. Some of them say, Ethiopia is 70% Muslim. Funnnnnnnyyyyyy!!!!! The following article is copied from (http://yidwithlid.blogspot.com/) blog. It has interesting points. Two weeks ago an Islamofacist website,http://ek-ls.org, (which is hosted by American Company NOC4Hosts Inc. in Florida) posted a message called "As You Condemn Others, So You Will Be Condemned." Written by a terrorist group called Harakat Al-Shabab Al-Mujahideen. message threatens to attack the capitals of African countries which are participating in the peacekeeping force in Somalia, the worshipers of the Cross. "Whoever Fights Us - We Will Hit Him Back with All [Our] Might"
"… We stress that we will retaliate. Whoever banishes Muslim nations [from their lands] grants us permission to banish his people [from their land]; whoever kills our women - we shall kill his women; whoever attacks our dignity - we shall give him what he deserves; whoever turns our mothers into widows and our children into orphans - we shall turn his mother into a widow and increase [the number of] his orphans…"
"The soldiers and people of the states that are participating in the occupation of our country have become part of the Crusader alliance led by the global criminal Bush, and [partners in] the war he is waging on all the Muslims. Thereby, they have made themselves targets for attacks by the Muslims who are protecting themselves and their religion. "And just as they rallied under the banner of the global Crusade against Islam, we [now join] the mujahideen in the global Islamic war against the Cross; just as the Abyssinians [Ethiopians] are helped by their brethren, the worshippers of the Cross, so do we have our Muslim brethren in all the countries of the world, including the countries from which [the soldiers of the peacekeeping force in Somalia] come - [namely] Ethiopia, Uganda, Burundi and so on… They stand with us and we stand with them against [our] common Crusader enemy." The following article is written by an anonymous Deje Selam reader. Thanks. Pro - Islam government”. This is the title for an article I read .It is an amazing title and the facts that are put out seem true for those who does not see or realize what the writer is trying to prove. I am sure deep in your heart you know what you are saying is not true there has never ever been a king called Negashi and I know you know that negashi mean "King" it is not a name. This is all fiction that you want to believe or the globalization of Islam are influencing you to believe and about the 70% population please look at the recent statistics it exactly the vice versa. It completely understandable if you are saying this for one region alone like ogaden but for the over all country that is so untrue. Sometimes when you talk of a lie again and again it sounds true. I have also seen that you wanted to imply that the government is influenced by the EOTC on decision making and the church has more rights but a recent incident at the Meskel square at the eve of Gena is one. The church has spent 100K for the program but it was cancelled at the last point where as the Muslim holiday are celebrated as many time as wanted at the AA stadium how about that for a right? You have mentioned repeatedly that Ethiopia is no more a Christian country but a country of equality and peace and love I will agree on that because those are all the signs of Christianity (love, peace and hospitality). It is this hospitality that led to this. Christianity is in blood of all of us even you. We are the people of peace and love. We are a Christian nation. The EOTC has been tortured for decades by the Islamic world that is a fact that whole world knows but did that convert the country into an Islamic nation NO instead we were more in number and we will be more in number .What you are trying to do is not new. It is in every part of the world that Muslims want to sound abused, discriminated but if you think of it you are the once who have the right to break any dress code because your religion requires you to were different, you are the once who have the right to prosecute the person for tearing a Quran, you are the once who has the right to scold Jesus but if some one speaks of Mohammad you hit the roof. This is what you want the whole world to believe, trust me my friend you can NEVER kill the truth. Some time try to use an Ethiopian instinct (fairness and just) and see beyond the Islamic globe. Let us not put thing that are not useful to us let us live in peace as we did. You are an Ethiopian and Islam is a guest and will be for ever in Ethiopia. But after all the bad thing about Christianity is that it can’t force you to be a Christian except love you dearly .You are always welcome at my home my friend. Ashura of the millennium to be celebrated on Nejashi Mosque???????? Dear Readers, This is one of the funniest historical fallacies fuelled by the pro-Islam Ethiopian government. The issue of a "converted Islam" Axum king has been time and again protested by the Ethiopian Orthodox Church and Its Holy Synod. As usual, the government ignored the protest. Look how we are being Islamized with the help of global fanatic Islam in general the Wahhabi terrorists in particular. When the fanatics, http://ethiopiajustice.blogspot.com/, read these comments, they say we are ignorant of history, we are intolerant to Islam etc. They use the same kind of techniques to shut their critics mouth. That is what they are doing even in USA. They call people racist, if he or she opposes their militancy. Now they are doing it in and to Ethiopia. We will not back off. Addis Ababa, January 9, 2008 (Ethiopian News Agency, Addis Ababa) - Preparations have been underway to introduce and promote the “Nejashi Mosque”, one of the historical relics of Ethiopia in Tigray region, to the rest of the world, the Asehama Nejashi Culture and Education Center said. It also said preparations have been finalized to celebrate the “Ashura” of the Millennium, a holyday of Muslims coming a month after Id Al Aldaha, on 18 Jan. 2007 on the premise of the mosque. Center Director General, Mohamed Ahmed told ENA that the mosque is named after an Ethiopia king who welcomed Muslim refugees some 1,400 years ago. Mohamed said the mosque, which is taken as a symbol of religious co-existence, is becoming one of the tourist attractions worldwide. The deed of the king enabled Prophet Mohamed, who is the icon of Muslim history, to substantiate that Ethiopia is a country of brotherhood and sympathy, he said. The king was also known to fight against corruption, which is the evil of the current heads of state and government worldwide. The government of Ethiopia is striving to register the mosque as one of the world historical heritages, he said. The center, established in 1990 E.C, has already received 110, 000 Sq. meters of land to build research and other facilities. On December 18 last year the UN General Assembly adopted a raft of resolutions recommended by its Third Committee (Social, Humanitarian and Cultural). While many of them were progressive - one called for a moratorium on the death penalty - there was also one long campaigned for by the Organisation of the Islamic Conference: “combating defamation of religions”. Draft resolution VI on Combating defamation of religions (document A/C.3/62/L.35), approved as orally revised by a recorded vote of 95 in favour to 52 against, with 30 abstentions, on 20 November, would have the Assembly express deep concern about the negative stereotyping of religions and manifestations of intolerance and discrimination in matters of religion or belief, still in evidence in some regions of the world. The Assembly would emphasize that everyone has the right to freedom of expression, which should be exercised with responsibility and may therefore be subject to limitations, according to law and necessary for respect of the rights or reputations of others; protection of national security or of public order, public health or morals; and respect for religions and beliefs. In favour: Afghanistan, Algeria, Angola, Antigua and Barbuda, Azerbaijan, Bahamas, Bahrain, Bangladesh, Barbados, Belarus, Belize, Benin, Bhutan, Bolivia, Brunei Darussalam, Burkina Faso, Cambodia, Cameroon, Cape Verde, Central African Republic, Chad, China, Comoros, Congo, Costa Rica, Côte d’Ivoire, Cuba, Democratic People’s Republic of Korea, Democratic Republic of the Congo, Djibouti, Dominica, Dominican Republic, Egypt, El Salvador, Equatorial Guinea, Eritrea, Ethiopia, Fiji, Gabon, Gambia, Grenada, Guinea, Guyana, Haiti, Honduras, Indonesia, Iran, Iraq, Jamaica, Jordan, Kazakhstan, Kuwait, Kyrgyzstan, Lao People’s Democratic Republic, Lebanon, Lesotho, Liberia, Libya, Malaysia, Maldives, Mali, Mauritania, Mauritius, Morocco, Mozambique, Myanmar, Namibia, Nicaragua, Niger, Oman, Pakistan, Philippines, Qatar, Russian Federation, Saint Kitts and Nevis, Saint Lucia, Saint Vincent and the Grenadines, Sao Tome and Principe, Saudi Arabia, Senegal, Sierra Leone, Singapore, Somalia, South Africa, Sri Lanka, Sudan, Suriname, Swaziland, Syria, Tajikistan, Thailand, Timor-Leste, Togo, Trinidad and Tobago, Tunisia, Turkey, Turkmenistan, Tuvalu, Uganda, United Arab Emirates, Uruguay, Uzbekistan, Vanuatu, Venezuela, Viet Nam, Yemen, Zambia, Zimbabwe. Against: Andorra, Australia, Austria, Belgium, Bulgaria, Canada, Croatia, Cyprus, Czech Republic, Denmark, Estonia, Finland, France, Georgia, Germany, Greece, Hungary, Iceland, Ireland, Israel, Italy, Latvia, Liechtenstein, Lithuania, Luxembourg, Malta, Marshall Islands, Micronesia (Federated States of), Moldova, Monaco, Montenegro, Netherlands, New Zealand, Norway, Palau, Poland, Portugal, Republic of Korea, Romania, Samoa, San Marino, Serbia, Slovakia, Slovenia, Spain, Sweden, Switzerland, The former Yugoslav Republic of Macedonia, Ukraine, United Kingdom, United States.